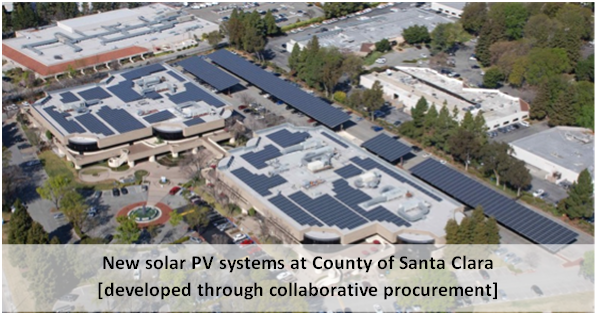 Collaborative procurement is emerging as a powerful means to tackle the costs and technical barriers to public investment in solar energy projects . However, upfront costs for high-quality solar potential assessments, RFP/RFQ development, and vendor evaluations prohibit many public entities from identifying and pursuing high-potential projects. To help address this barrier and to unlock the power of collaborative procurement for the public sector, Strategic Energy Innovations (SEI) and Optony Inc. have created the SEED Fund, or the Solar Energy and Economic Development Fund, which a unique opt-in program to empower public agencies to evaluate and participate in a regional group purchase of municipal solar PV projects. A key feature of the program is that it leverages regional funding (e.g. grants, community investments) to defer upfront allocation of funds for project planning, site assessments, or procurement activities; rather these costs will be paid back through solar contracts that are developed with vendors to create a revolving fund for future work , so participants can fully evaluate their opportunities and costs before committing any resources. SEED Fund Team: SEI and the SEED Fund Technical Service Provider Optony Inc. ; organize regional funding sources; provide technical and logistical support to facilitate participants’ evaluation of solar potential; manage the procurement process and vendor evaluations; and oversee fund activities to maximize regional impact. Coordinating Agency: One public agency who is committed to securing PV for their facilities and is willing work with the SEED Fund Team to develop and issue the RFP/ RFQ on behalf of themselves and the other regional participants. PARTICIPANTS: Local governments, agencies, and schools who want to evaluate solar potential and who may want to participate in the collaborative procurement to reduce their energy costs while improving the regional environment and economy. CPUC Press Release – List of grant awardees from the California Public Utilities Commission. Click here to view the announcement. Project Overview Presentation – Slide-deck presentation of the SEED Fund project background and goals, in addition to benefits of collaborative solar procurement. Click here to download. SEED Fund Benefits and Savings – Explanations and examples of how the SEED Fund provides financial benefits to all participants. Click here to download. Finance Workshop Presentation – Full presentation from SEED Fund Workshop: Solar Project Financing & Economics Discussion. Please enter your contact information here to receive an electronic copy of this document. PV Carport Examples – Compilation of solar carport installation photos. Please enter your contact information here to receive an electronic copy of this document. Technical Workshop Presentation – Full presentation from SEED Fund Workshop: Solar Project Installation and Technical Considerations. Please enter your contact information here to receive an electronic copy of this document. See World Resources Institute’s 2012 publication “Purchasing Power: Best Practices Guide to Collaborative Solar Procurement” here. SEED Fund Participation costs are estimated at 1-2% of total Solar project costs, and Project Cost savings from participation are estimated at 10-12% of total solar project costs, resulting in a net cost savings estimate of 8-11% for participants. Strategic Energy Innovations, is a non-profit organization dedicated to reducing pollution and saving money through energy and resource efficiency. Optony Inc. is an independent solar consulting firm specializing in supporting public and private solar programs and projects and helped to pioneer this collaborative approach.